The curved lips of crocodiles make them appear to be always grinning. Crocodiles make many noises and will leap high out of the water to eat snakes and birds (as well as other creatures). Adult brolgas dance by stepping forwards and back, shaking their wings, jumping in the air and throwing and catching grass. Occasionally they will look for food under mangrove trees. These trees grow in swampy areas and on drier ground. 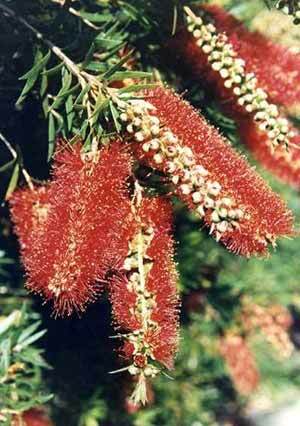 Their flowers have long thread-like stamens and very tiny petals, and do look like red, cream or white bottlebrushes. Echidnas are hairy and spiny mammals but lay eggs. The mother’s milk is pink. Baby echidnas, called puggles, live in their mother’s pouch until their spines harden and become sharp. 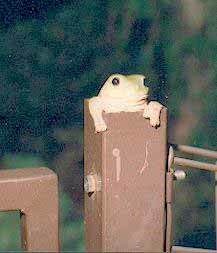 Green tree-frogs have toe-pads to help them climb trees, but they also enjoy sitting in drain-pipes, sinks and toilets. This one is in our gatepost. They shoot out their sticky tongue to catch small insects. 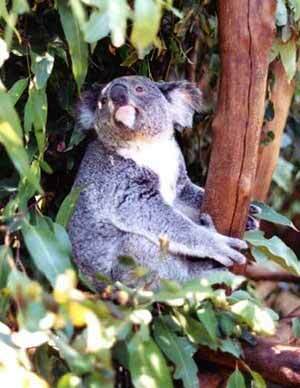 Koalas only drink a few times a year. Their new-born babies are baked-bean size and crawl to the mother’s pouch. There, they face backwards when they have grown big enough to look out. 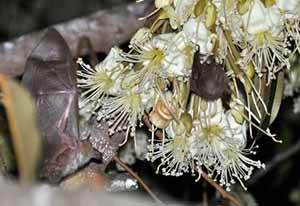 Northern blossom bats are so small they can hide under a flake of bark or in a curled up leaf. They fly in the daytime or at night to feed on bottlebrush and mangrove tree flowers…and also durian flowers as photographed here by Barbara Maslen and Allen Sheather. Dingos are a kind of medium sized dog, but they cannot bark – though they do howl. 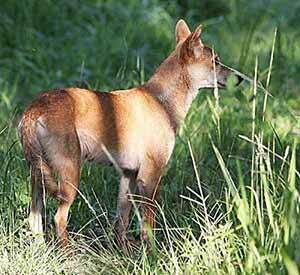 Unlike the ears of a normal pet dog, a dingo’s ears always stand upright and never flap over. Its name sounds like its call. Owls have one ear higher than the other. The edges of their wing feathers are split into hairy strands to help them flap silently to surprise and catch their food. This is a juvenile (with a Willie Wagtail behind it). 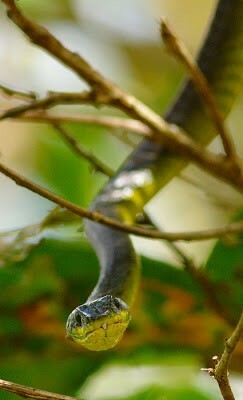 ‘Brown Tree-Snakes’ found in mangrove trees have dots – but this one is sitting in the middle of the road. 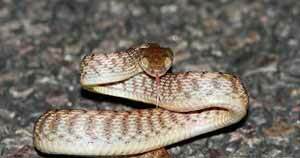 The image on the left is of a Common Tree Snake. The ‘white-bellied mangrove snake’ is the only snake that pulls its food apart (crabs) – all other snakes swallow their food whole. 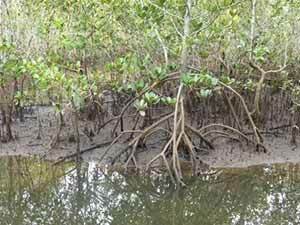 Mangrove trees enjoy living in salt water and mud. Many have special upward growing roots that take air to those underground, or stilt roots that hold the trunk above the water. 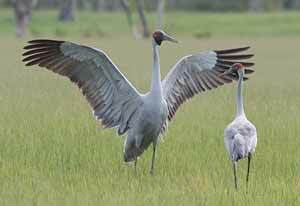 A brolga’s favourite foods are insects, worms, frogs and plant roots. They might find curly moth and butterfly larvae (caterpillars), and beetle larvae that fall off leaves and into the mud under mangrove trees. Caterpillars have about three times as many muscles as humans. To escape their enemies, some can instantly turn themselves into a wheel and roll away at a speed of 20 centimetres (8 inches) a second. ‘Long-tailed pygmy possums’ have a hairy tongue to help them drink the sugary nectar from tree flowers. While they are drinking, yellow pollen dust from the flowers collects on their fur – they then comb off the pollen with their claws and eat it. 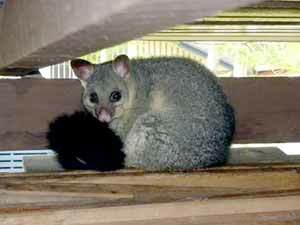 This photo, however, is of a brush-tailed possum, the commonest kind of possum that lives in towns and cities. It’s about the size of a cat and is sitting on wood that’s stored on a shelf just under our shed roof. Goannas are big lizards that can grow to be 2 metres (over 6 feet) long. When they are frightened they run at high speed on their hind legs and will also climb trees, moving around the trunk to remain hidden from sight. You will often find them looking for scraps at picnic grounds. Aboriginal people like to eat goannas that have been cooked in a pit. A kookaburra’s call does sound very much like someone laughing. First one starts, then all the others in the neighbourhood join in. Kookaburras like living near people and will steal hot meat and a sausage while it’s cooking on a barbecue. 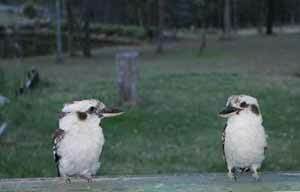 This link is to a YouTube of kookaburras laughing. 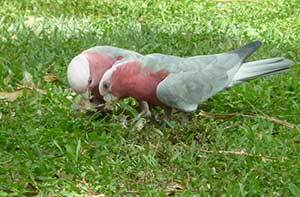 Galahs are pink and grey coloured parrots. Sometimes they will gather together to be in flocks of a hundred or more, and will fly long distances to find good feeding grounds. 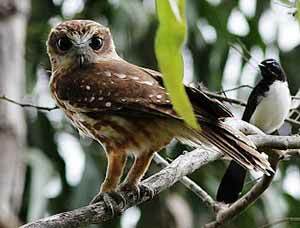 They make their nests in hollows in trees and originally were mainly found in the drier central parts of Australia. However, since Europeans came to the country, they have now spread to most other areas, and you can often see flocks on playing-fields and golf courses. They generally prefer fairly open places where they can strut on the ground to look for seeds, fruits, roots and buds to eat. When flock numbers are huge they can do a lot of damage as a group when they descend to eat a farmer’s crop of wheat or sunflower seeds. A galah, in Australian slang, means a foolish person. The word galah, for the bird, is a cross between the Aboriginal names of gulah, gillar and galar.